Posted by Irish Street Art in Featured Street Artist. Fresh from her monster piece ‘Godzilla Vs The 15′ Luchador‘ on the Lisburn Road in Belfast, Friz hooked up with IrishStreetArt.com to share a few stories. Enjoy! I grew up near the graveyard where W.B.Yeats is buried and we used to spend lots of time hanging around there in the Summertime when we were little( there’s a tea-house and the owner used to give us free ice-cream). Just as you’re leaving the graveyard there’s an old headstone with the name ‘Frizzelle’ on it. I used to take note of names I liked and found interesting to name my characters and I’ve always loved that one. I’ve been using Frizelle (my memory obviously leaving out the second z) for years and just shortened it to Friz for convenience. How would you explain your technique and style? I studied classical animation so that’s had a huge impact on my style, with Western and Eastern influences. My work is usually stylised and illustrative, I tend to break the rules of anatomy for my own needs when it suits. Technique-wise, when I’m using spray paint, I’m currently going for an animated cel-shading look with defined shadows. I just like to keep it clean and sharp, with lots of cut backs. I’ve been meaning to experiment more with tonal shading so that’s where I think my stuff will be heading down the line. I love me a skinny cap. What brought you from Sligo to Belfast? I was actually in Edinburgh before moving to Belfast. I just felt like a change and my boyfriend was based in Belfast so I figured I’d give it a go. I’m glad I did because the music and art scene here is so energetic, don’t think I would have started painting murals if I’d gone anywhere else. Could you tell us about the SPOOM Collective? 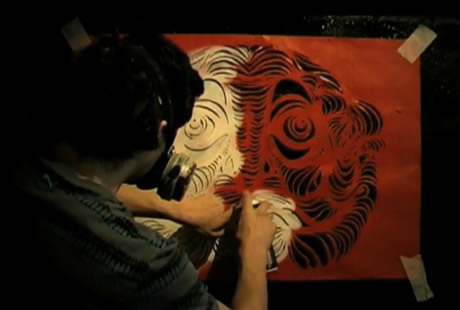 SPOOM came about pretty organically as a collective of artists/mates who frequently collaborated on large scale pieces. I did a ‘Street Art’ course in Belfast run by Trans when I moved over originally, that’s where I met KVLR (who was facilitating), Redmonk, Horsegoat and Lucas. Eventually expanded to include Bad Seed and MarcaMix. The line up changes with each piece but it’s all SPOOM. There’s also a host of other collaborators we’ve had the pleasure of working with. Members are pretty spread out over Ireland and the UK at the moment: Belfast, Dublin, London and Edinburgh. I love that everyone involved has a really unique style so the challenge is to make a piece look harmonious. You seemed to have a crazy productive summer can you fill us in on your highlights? Yeah, happy to say I’ve been busy! Highlights I guess would be revisiting a wall in Belfast with KVLR as part of the Cathedral Quarter Arts Festival that we’d painted a few years back, it was nice to give it a facelift since I’ve gained confidence using spray cans and the original piece was only the second time I’d spray painted anything. Hit a few festivals this year, Kings of Concrete, No Place Like Dome, Glasgowbury and Bray Summerfest. There’ve been two epic Whitewash events this summer run by the mighty DMC, always lethal craic with good people. Also particularly happy with the two pieces I did in my hometown this Summer, both steeped in local myth and legend, one of which was on 500′ of hoarding. Painting on the Peace-line in Belfast is also up, it’s such a historic wall and there’ve been some amazing pieces painted there. Got a chance to collaborate with some old and new faces as well, KVLR, Verz, DMC, JMK, Rask, Art by Eoin and This Means Nothing. What can we look forward to from Friz in the future? Really excited about the Fesitval of Urban Art Sandyford 21st-23rd which I’ll be painting at on the Saturday and Sunday. The line up is immense. Culture Night in Belfast the Friday before is setting up to be epic as well, going to be lots of artists live painting on the day. Also going to be collaborating with Conor McGrath (FALL Longboards) and Kieron Black on an exhibition early next year in Belfast where we’ll painting on skate decks, yeo! Adam, KVLR, Redmonk, BadSeed, HorseGoat, Bore, Lucas, MarcaMix, Doc, Danleo, Mick Minogue, DMC, JMK, Rask, Verz , This Means Nothing. Friz is a Belfast based artist who works in both traditional and digital mediums. Her work is influenced by the study of classical animation. Friz is part of the SPOOM Collective, a group of artists who frequently collaborate on large-scale murals. Friz’s work largely revolves around the female form, creating a world of sometimes sassy, sometimes sensuous characters. She has been invited as a guest artist to paint at such events as ‘Eurocultured’ in Manchester , ‘Smithfield Festival’ in Dublin, ‘N.P.L.D.’ Festival in Sligo and the ‘BASE Festival’ in Belfast. Posted by Irish Street Art in International Street Art. Nice stencil, great final piece! IrishStreetArt.com documents urban art from all over Ireland and the world over the past few years. We also aim to keep you up to date with all the latest street art news and events.